For a quick refresher this is a Brazilian based company run by the sweet and super responsive Katia Ferriera. These hot little tickets of stamping awesomeness were once fairly difficult to obtain due to their location and popularity. Once upon a time you could get them at the now closed Ninja Polish, but now a-days you can get them right here stateside from the DRK Nails shop. This brand recently reopened doors bringing us the much coveted XL A-D plates and some new hot tamales called the Designer Series. These beautiful plates were mainly designed by Adriana Portas and are entirely unique from any plates I've seen today. Each also come with a blue protective film once you remove them from the clear plastic wrap. They are backed by a hard plastic frame, similar to those that we have seen from MoYou London and the Dashica Beauty Infinity series, with a superficial DRK nails logo sticker on the back of the plate. Let me point out to you now all the DRK Nails plates come with the new plastic hard backing. The XL A and D plates I purchased also had them. The plates themselves measure 13 cm tall x 7 cm wide, and feature 10 full sized nail images. These images "kiss" for lack of a better word on the plate so when I measured out the size I measured from the extreme outer edge to extreme outer edge of each design. 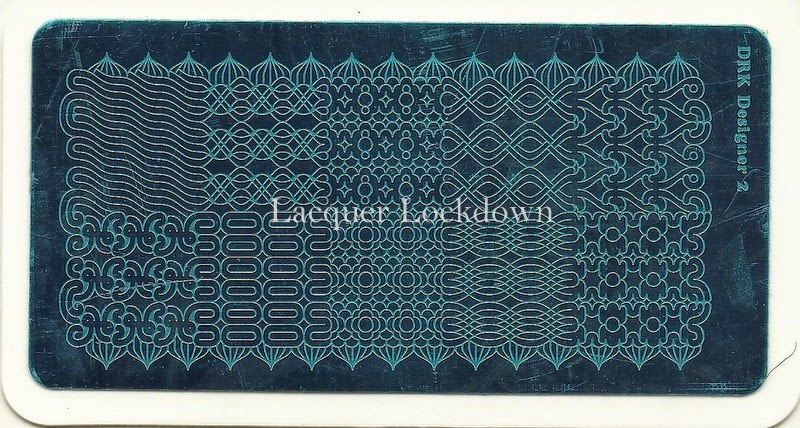 The images do vary a bit as you can see, but the full sized images for these plates measure 3.0 x 2.0 cm (length x width). Most of the images have a little border surrounding them that is the same for every image. I did include that border in the measurement of the length. Regardless even without the borders these plates are going to work well for anyone with medium to long length nails. As usual I included a few other full nail image sizes below so that you can compare brands. As with all my reviews when swatching out the images I used Wet N' Wild Black Creme. For a change I did not use and my gold standard XL marshmallow stamper from Bunny Nails (3 years prior), but instead used my Magno Nails stamper which is also a marshmallow stamper. The reason I chose to do this is that I wanted to increase the amount of image I was picking up per swatch and the Magno Nails stamper has a bigger diameter. I did not require Konad Special Stamping polish or Mundo de Unas for these plates as the etching was superb. Don't forget you can click on the images to enlarge them for greater detail and clarity. Note: I want to say this clearly after engaging in some discussions about stamping and quality of images and plates in general. The reason I choose to stamp with Wet N' Wild Black Creme for my swatches is because it's cheap and readily available. Furthermore it is the lowest quality polish I can use for stamping. What does that mean? It means I don't expect images generated by WnW to have near the clarity of those generated using a polish designated for stamping. Stamping polishes allow an image to stamp with even more clarity and crispness than regular polish. Period. 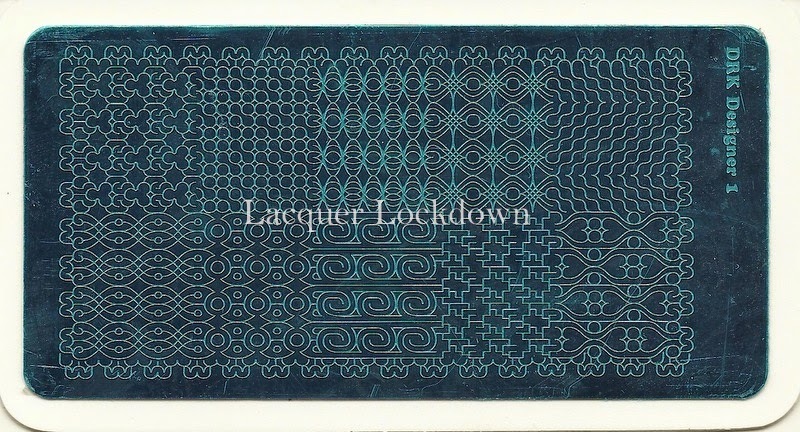 In short if I have a plate that stamps well with WnW polish this is my assurance that indeed the etching on these plates is excellent enough to support stamping with a polish that is not meant for that purpose. This is the second review I've put out in about as many weeks that has plates that are absolute flawless. In fact these plates are etched so fantastically and required so little effort for me to pick up and transfer that it was almost ridiculous! It's been a while since I've had such effortless stamping in a new to me brand. Once again I didn't have to use one trick, change polishes, or switch to a even softer marshmallow stamper. This is another example of an owner that was extremely meticulous when it came to production and their tester plates, and the quality of these plates is truly a testament to that. I'm not sure how these designs will translate on the smaller nail crowd as they are quite large but they are so beautiful I'd think it'd be worth the undertaking. One thing that really blew me away with these plates is just how freaking crisp every single image was transferring considering I was using Wet N' Wild! Another piece of great news for you stamping fanatics? 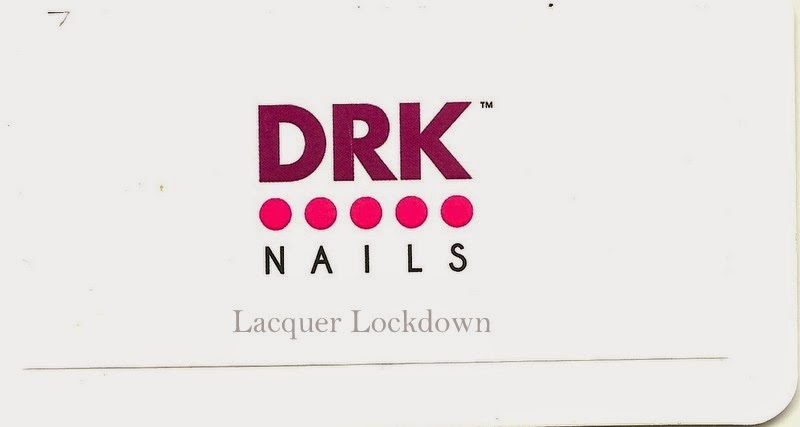 DRK Nails products are now stateside. Yup that right and the shipping is crazy reasonable. We are talking $2-3 and the first class option also comes with tracking at no extra cost. Unbelievably affordable pricing for shipping right? So basically I just talked a good game. You might be wondering given these were sent for review whether you can adhere to what I say regarding these plates. The answer is yes. The minute the shop opened I rushed to get XL plates A and D which were missing from my collection and yes they are equally superb. Plus I let my swatches do the talking and as you can see they are on point. These products were sent for my honest review for more information please see my Disclosure Policy. I tried to get these and although the site let me order and took all my info it would not open the drop down window where you specify type of payment to let me pay for these. I tried exiting and reopening several; times, maybe they are still working on getting this going again? fantastic and well written review! I ordered these plates earlier this week and I absolutely cannot wait to get them in the mail. More excited about them now than ever because of your review! Thanks Tamira. Wonderful review. We are so glad that you approved our product. And Cindi, just write a message to contact@drknails.com so we can help you with your order. Thanks!